Just confirming what we all suspected. 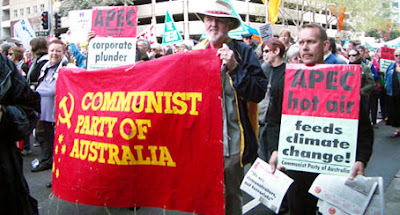 The Sydney District Committee of the Communist Party of Australia, with the support of the Central Committee, participated in the anti-APEC actions of the weekend of 7-9 September. The Party had representatives on both the organising committees for the "Festival" and the "Stop Bush Coalition". Party members of the Sydney district were then very active over the APEC weekend participating in the Anti-APEC Festival of Friday Sept 7, and the very successful Rally and March of Saturday September 8. A Party stall was set up in Hyde Park for both events. The District Committee also organised a fund raising dinner called "The Real Story of APEC" with Michael McKinley, political commentator from the ANU. The dinner was well attended and the after dinner speaker and entertainment from a Kurdish performer were warmly received. Banners and placards were prepared well in advance for the rally but was restricted by the Police policy of only allowing one metre poles in the rally. The District Committee extends its congratulations to all Party members and Guardian readers who participated in the anti-APEC events over the weekend, and warm thanks to those who assisted in organising them. The CPA participated, sure, but would be lucky to mobilise more than 500 or so. The DSP/SA and the ISO/Solidarity crowd, joined by the anarcho-autonomist scene, mobilised most of the hard left. Unions, Greenies and anti war groups provided the rest. Thanks anon. I realise that DSP, ISO etc played their role-comrade Bainbridge was prominent, but the CP is "da man". Warren Smith leading the MUA contingent is a case in point.